To save you the most money Family Vision Center co-manages laser vision correction surgery. Call us at 203-377-2020 to schedule a pre-op appointment with one of our experienced optometrists who will review your options and if needed will refer you to a laser vision correction office that best suits your needs. Once you have your laser vision correction surgery we will provide you with the highest quality follow-up care. Our staff will explain the laser vision correction procedure in detail and discuss what results you should expect. How is laser vision correction performed? During your laser vision correction procedure a flap is cut in your cornea and is then folded back. A laser is used to make the cornea a flatter shape. To complete your laser vision correction the flap cut in your cornea is then put back. The entire laser vision correction procedure only takes a few minutes to complete. Although the process of laser vision correction sounds painful and uncomfortable, most patients don’t feel anything. The healing process is just as short as the actual laser vision correction procedure. Many people report drastic results within the first day after the procedure. 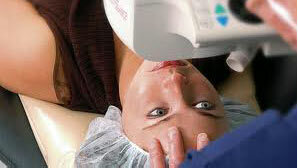 Although results from laser vision correction can be seen immediately, your vision will continue to improve over time. Patients who undergo laser vision correction can see better than wearing glasses or contact lenses pre-op. We will work with you to find an experienced surgeon to perform your laser vision correction surgery. Family Vision Center refers patients to surgeons that specialize in laser vision correction and have excellent success rates. Our optometrists specialize in laser vision correction co-management and will follow-up with you after your procedure to monitor your results. Following up with our optometrists will allow for detailed one on one exams that are not always possible with a laser vision surgeon. Our staff will work with your surgeon to ensure your laser vision correction surgery has long lasting benefits.